One of Britains foremost printmakers, Norman Ackroyd CBE RA has spent a lifetime recording the coastal landscapes of the British Isles. A Shetland Notebook contains forty of his vivid landscape sketches in watercolour. Made in the open air, often aboard a pitching and tossing fishing boat, these lively, spontaneous works capture the unique atmosphere of these remote and beautiful islands. The notebooks unusual format is due entirely to the artist, who uses sheets of various types of paper torn to fit into a loose-leaf ring binder made from two pieces of wooden picture-backing; this he tucks into his coat pocket, ready for use whenever the need arises. His brief but engaging commentaries place each sketch in its context. 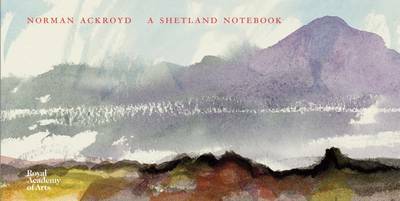 Following the success of A Line in the Water , Ackroyds collaboration with the award-winning poet Douglas Dunn OBE, published by the Royal Academy in 2009, A Shetland Notebook is an essential purchase for all admirers of this most characterful artists work.